Jumping back into the cook book challenge this week, I turned to a book that fills me with indecisions like few others. 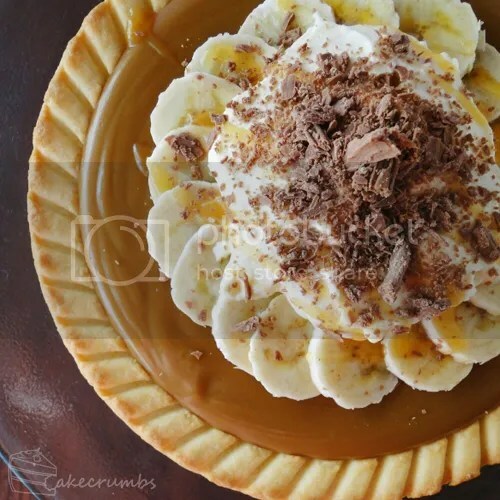 As the name suggests, Dream Desserts is filled with dreamy recipes for every occasion. From winter warmers to light summer desserts, from the simplest of cakes to decadent desserts that require a bit of know-how, this book has it all. 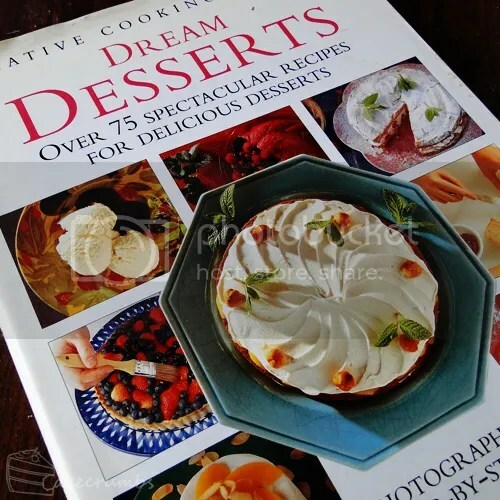 What's more is that this book has a lot of desserts that are quite different from what I would usually do, or create, or crave, myself, so it encourages me to try some new things. Or a Boston Banoffee Pie, to be exact. I have no idea what makes it specifically Boston-esque as I can't see how this differs from the traditional English version. Semantics aside, this pie is made of nom. If you have a food processor, making the pastry base is a cinch. If, like me, you don't, rubbing the butter into the flour is going to be more arduous and messy than your basic scone dough requires, but the result will be worth it. For the best short crust pastry, don't over work it. It's ready when it forms clumps when pushed together like so. The recipe says to use a fluted flan dish, but any tin or ramekin or pie dish will do. If you use a pie dish, you can have a bit of fun with the crust. We got all excited about the caramel and if it wasn't so piping hot, it may never have made it into the pastry case. After burning my mouth on a taste-test, it was deemed that the case was the best home for the caramel. For now. Once it's cooled, it's decorated with bananas, cream and chocolate. I used Cadbury Flake to top this one off, because nom. I had such a disasterous day in the kitchen making this one, so to have something pie-ish by the end of it was a relief. This baby ended up as dessert for us for the next three meals. It was delicious. 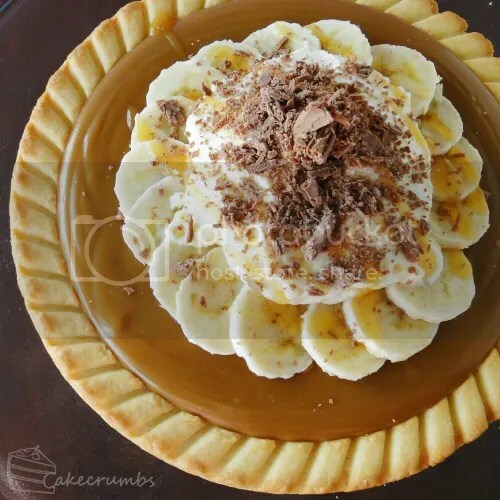 While I like bananas, I usually have little desire to put them in desserts. They're not my absolute favourite fruit, but I have to say I loved them in this. In future I would probably include more than one ring of garnish of them. The bananas complimented it so well and cut through the richness of the toffee. Preheat the oven to 160°C/325°F/Gas 3. 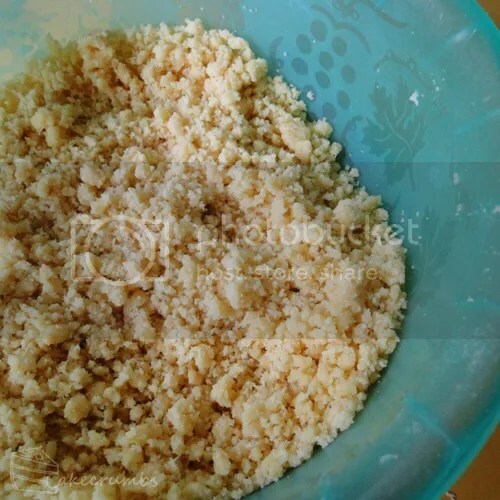 Place the flour and half of the butter in a food processor and blend until crumbled (or rub in with your fingertips). Stir in caster sugar. 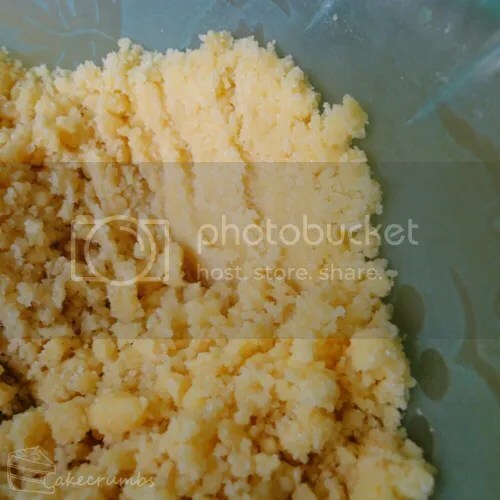 Squeeze the mixture together with your hands until it forms a dough. 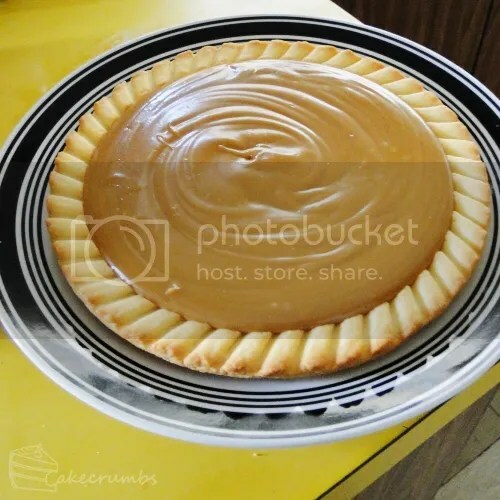 Press into the base of a 20cm/8in loose-based fluted flan tin. Bake for 25-30 minutes, until lightly browned. 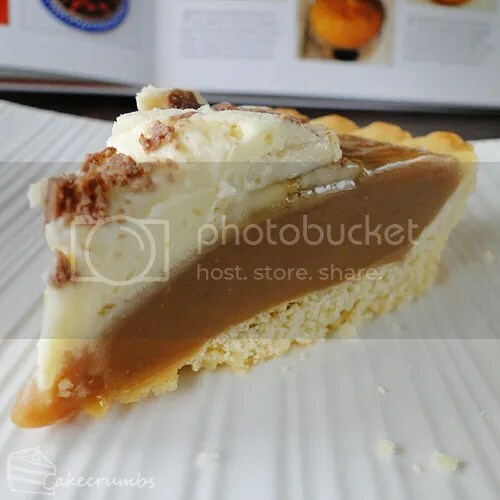 Place the remaining 115g/4oz/1/2 cup of butter with the condensed milk, brown sugar and golden syrup in a large non-stick saucepan and heat gently, stirring, until the butter has melted and the sugar dissolved. Bring to a gentle boil and cook for 7 minutes, stirring all the time (to prevent burning), until the mixture thickens and turns a light caramel colour. Pour onto the cooked pastry base and leave until cold. Sprinkle the bananas with lemon juice and arrange in overlapping circles on top of the caramel filling, leaving a gap in the centre. Pipe a swirl of whipped cream in the centre and sprinkle with grated chocolate. It was nice to try this after having seen it and heard about it a few times in the past. 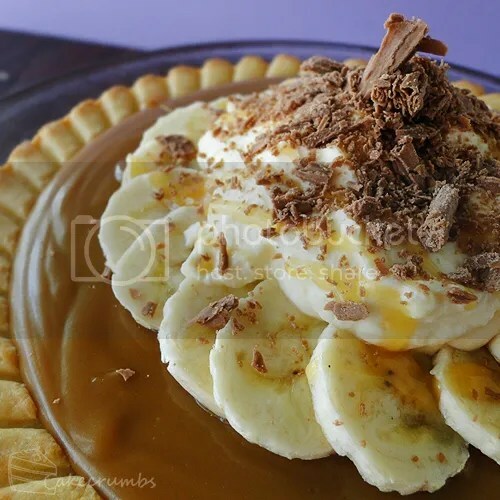 Definitely very yummy – loved the combination of the bananas with the caramel. All kinds of deliciousness involved! I tried this a few days ago and we loved it! The only criticism I got was that it was packed with maybe too much sweetness, so I was thinking of substituting this pastry with shortcrust pastry next time. What do you think? And yes, I’m not a banana fan either, but I’d put an additional ring of them here, too. P.S. : I’ve seen your christmassy posts, but I’ve yet to comment each one; just know I think you’re a genius! Re: All kinds of deliciousness involved! Apologies for the belated reply! As for the pastry substitution – I believe the pastry in this recipe is basically a short crust so not sure how that would go to solve the problem. I think it’s perhaps a bit too much toffee and not enough other stuff to balance it. I think next time I will probably line the base of the tart with bananas and add about half as much toffee. I think more fruit may make it a tad more bearable.